In honor of Mother’s Day, here are eight ways we North Carolinians keep our moms in mind all the time — not just in the month of May. The Mother Vine, on the outskirts of Manteo, may be the oldest living cultivated grapevine in America. Or not. It’s very old, and when things are very old, you just don’t know for sure. Anyway, the story goes that the vine may have predated the arrival of Sir Walter Raleigh’s expedition on Roanoke Island in 1584. It once covered an acre, but now it doesn’t produce as many scuppernongs as it used to. Then again, when’s the last time you heard of anyone doing anything productive after their 400th birthday. The Mother of All Tent Sales is the name given to a crocheting bazaar that happens in Little Washington every May. This sounds like a lovely event, but anything that leads with “The Mother of All” must come with an ad that features a reverb-enhanced voice screaming “EVERYTHING MUST GOOOOOOO,” footage of monster trucks, and 1980s video effects. Yarn people: Give me an old camcorder, and I will make this commercial for you, free of charge. The Mother of the Declaration of Independence may have been the Mecklenburg Declaration of Independence, which was crafted in Charlotte and carried to Philadelphia on horseback by Capt. James Jack. Its signing date, May 20, 1775, is still on the North Carolina flag. Charlotte throws an annual celebration on that day, and Jack’s likeness is now the subject of a statue near Uptown. There are, by my count, at least half a dozen restaurants in North Carolina with some form of “mom” in their name, including a fish fry in Maxton, a country kitchen in Hudson, a trattoria in Durham, and a sub shop in Lincolnton. Two — Mom’s Kitchen in Reidsville and Mum’s Jamaican Restaurant in Raleigh — were actually named to honor grandmothers. One was named Mom’s “by accident,” says the owner, because nobody could think of a better name. I won’t tell you which restaurant this is. It’s always bad to make a mother mad. Mother Murphy’s Laboratories in Greensboro has been making food flavorings for more than 70 years. They created frighteningly accurate flavors for the Harry Potter brand of jelly beans, including both the traditional (blueberry) and the gross (dirt). The company changed its name from Southern Laboratories to its current one in 1955. “Mother Murphy’s” was chosen simply because it sounded more kindly and less corporate even though, yes, there were Murphys working there and, yes, they had mothers. Do people get more Mom-related tattoos this time of year? “Not really,” says Dara Beck of Mom’s Studios in Wilmington. Nor do they ever get the old-school “Mom” inside a heart. 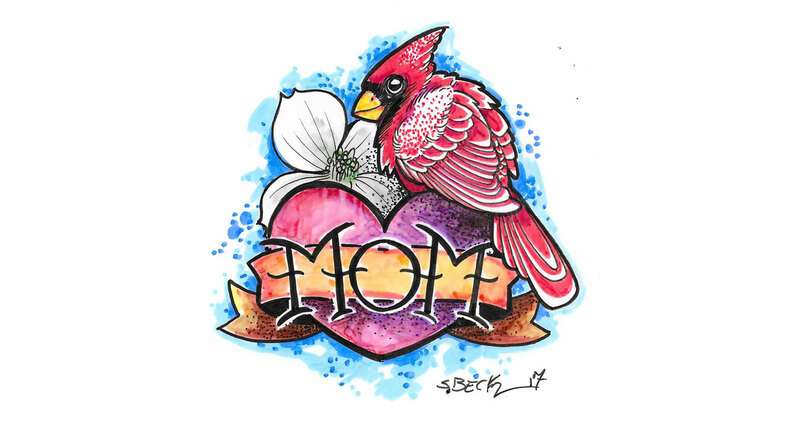 Instead, people dedicate more symbolic tattoos to their mothers, like flowers or birds. Going with “Mom” does have one advantage, though: It’s really hard to misspell. I don’t have a tattoo of my wife’s name, but I do have two beautiful children thanks to her. They have a North Carolina birthplace. I don’t. My mother still lives in Ohio. Her mother lives in Florida. But I’m halfway between, which means that when there needs to be a meeting of the mothers, North Carolina is obviously the best place to be.